Sony’s 3rd generation entry-level RX100 high-end compact utilises the same 20.1Mp 1”-type sensor as its predecessor, but with a new lens and built-in electronic viewfinder. As consumer appetite for small cameras with great image quality shows no signs of abating, we get more and more options onto the shelves. Who would have thought when Sigma first squeezed a large sensor into the DP1 a few years back, we’d now have compact cameras boasting not only APS-C sensors, but also full frame chips in their small shells. Sony has now developed 3 lines in its RX range of high-end compacts, including the full-frame RX1 series, as well as the RX10 and RX100 options, which both feature a smaller 1”-type sensor. Almost a year on from unveiling its predecessor, the RX100 II, the new Sony RX100 III appears to be more than just minor upgrade, with some pretty impressive looking additions to the spec’ sheet. Chief of these is the new built-in electronic viewfinder, or EVF, which was a feature sadly lacking from the mark II version. As we’ve said before, the Sony engineers are certainly keen on innovation, and the new 1.4m-dot ‘Tru-Finder’ EVF on the Sony RX100 III is a pop-up unit, so retracts back into the body of the camera when not in use. That’s got to be a first, and promising a clear display and ZEISS T coating, it’s a very welcome addition. There’s also new wide angle ZEISS Vario-Sonnar T 24-70mm f/1.8-f/2.8 zoom lens, which Sony say produces crisp images and beautiful background bokeh. The focal range of the new lens is shorter than the 28-100mm range offered on the RX100 II. However that lens only offered a maximum aperture of f/4.9 at the long end of the zoom, thus letting in almost 2 stops less light. Other new features on the Sony RX100 III include a ‘flip-up’ 3.0” LCD, for those must have ‘selfies’, built-in Wi-Fi, support for Playmemories Camera Apps and 4K still image output. Video performance has also been improved to offer full HD (1920x1080p) capture at a higher bit rate of 50 Mbps, with full sensor read out to an external recorder possible, as well as support for XAVC S file format. The sensor on the Sony RX100 III is a 20.1Mp back-illuminated 1”-type Exmor R CMOS, which offers the same resolution as its predecessor, but with a slightly different ISO sensitivity range. Whereas the RX100 II offered a maximum sensitivity of 25,600 ISO, the mark III now maxes out at 12,800 ISO, offering 1-stop less sensitivity. What difference this will make on what otherwise appears to be a very similar sensor, remains to be seen as we put Sony’s latest high-end compact through our sensor tests in the coming weeks. 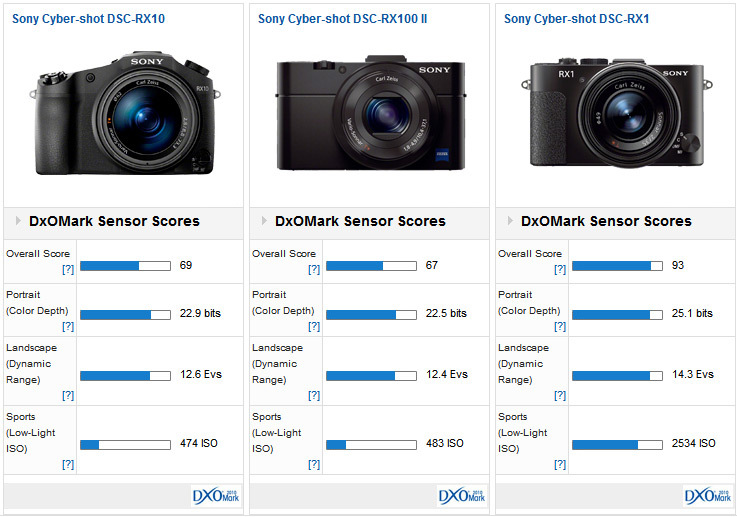 If we look back at the DxOMark Sensor Scores for the RX100 II however, you can see it competes very well against much of the high-end compact competition. With an Overall DxOMark Sensor Score of 67, the Sony RX100 II ranks 8th for all high-end compacts on our database, and an impressive 2nd for models using a smaller than APS-C sensor. That means it outperforms all of the compact camera competition from Nikon, Canon and others utilising a Four Thirds or smaller sensor. 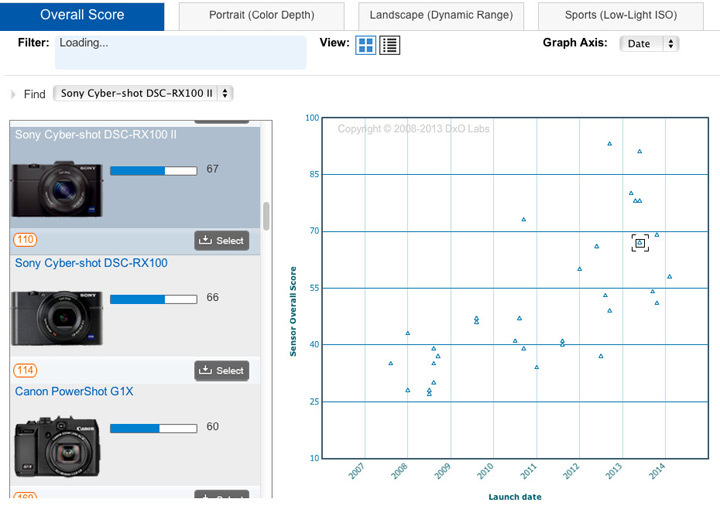 In fact it’s only beaten to the top spot by Sony’s own RX10 model, with a DxOMark Sensor Score of 69 points. So things look promising for the new Sony X100 III, and what’s more Sony have also included their latest BIONZ X processing engine, which is usually found on their top-end cameras, and offers powerful features for improved jpeg progressing. 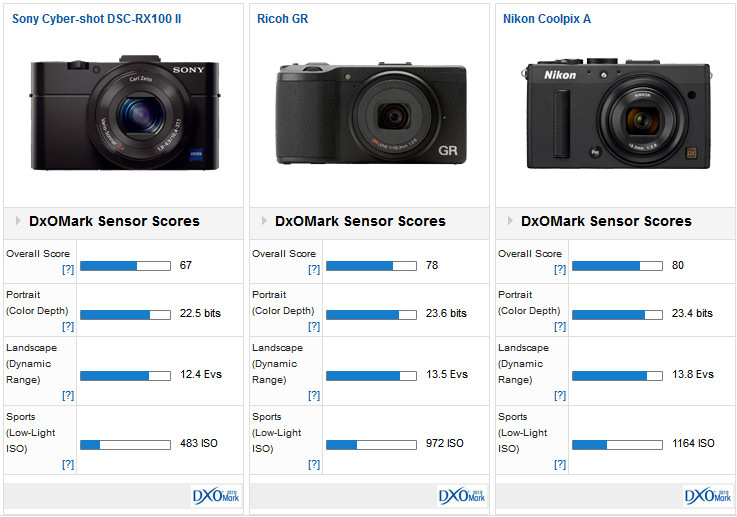 So as we wait to see how the latest Sony RX100 III will rank on our DxOMark Sensor Score database, let’s see how the current model fares against the different types of high-end compact competition. Unsurprisingly, boasting a full-frame 24Mp resolution sensor, Sony’s flagship RX model, the RX1, is head and shoulders above both the RX10 and RX100 II. With a DxOMark score of 93, the RX1 ranks 6th out of all sensors and top for Sony high-end compacts, achieving significantly better scores in all categories. That all comes at a hefty $2800 price tag however, compared to $1300 for the RX10 and $700 for the RX100 II and, with a fixed 35mm f/2 lens, the RX1 isn’t as versatile, either. Taking a step down in sensor size we can compare the RX100 II to the APS-C sensors found in the Nikon Coolpix A or Ricoh GR high-end compacts. Again the physically smaller sensor on the Sony can’t quite compete for quality, although the sensor scores are getting closer, as are the prices. The larger 16Mp APS-C sensors found in both the Nikon Coolpix A and Ricoh GR offer around 1-Stop improvement for measurements across the board, with the Coolpix A just outperforming the Ricoh GR for ISO performance. Although in a similar price bracket, both the $1100 Coolpix A and $ 750 GR offer a fixed focal length 28mm f/2.8 lens, so are less suited for general use than the Sony RX100 II. If it’s a more versatile camera with a zoom lens you desire, how does the Sony RX100 II compare against the competition from Nikon and Canon? The $800 Canon G1 X II, $550 Nikon P7800 and $700 Sony RX100 II all utilise slightly different sized sensors, with different resolutions, but are more traditional compact style cameras. 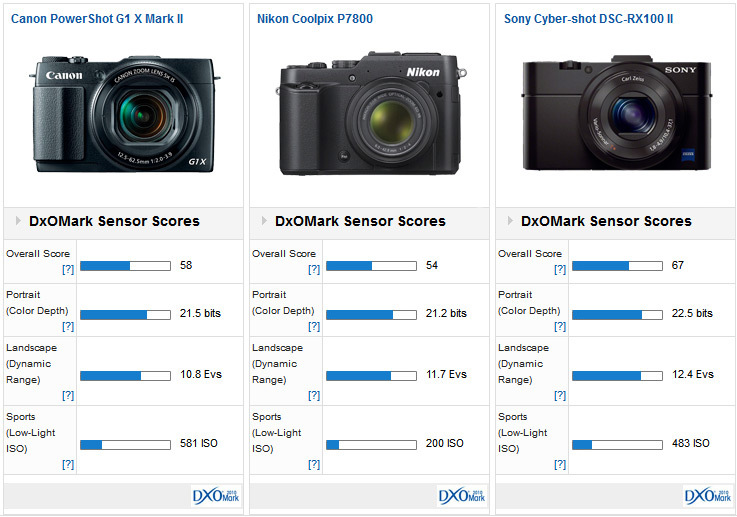 DxOMark Sensor Scores for the Sony RX100 II out-trump both the Nikon & Canon competition overall, even though the Canon G1 X II utilises a larger 1.5”-type sensor. The Sony model wins across both Colour Depth and Dynamic Range measurements, although that larger sensor in the Canon gives it marginally better Low-Light ISO scores. All these options boast zoom lenses however, with the P7800’s 28-200mm offering the longest reach. Whilst the P7800 has a built-in viewfinder of some variety, the Sony RX100 II doesn’t, although an EVF that attaches via the hotshoe is available separately. 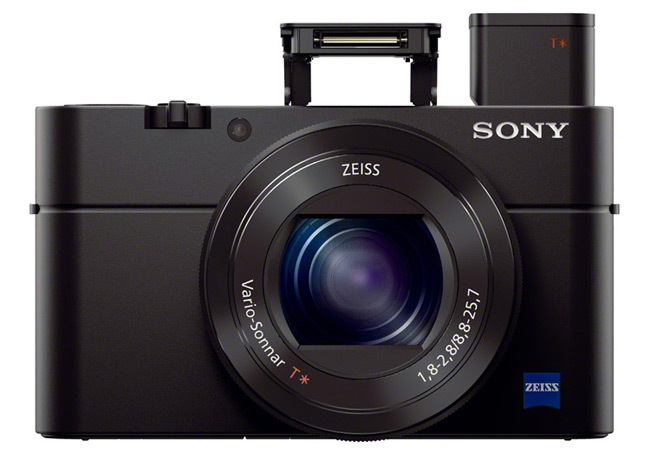 The additional of that pop-up EVF on the latest Sony RX100 III model is a most welcome addition therefore, and if the sensor performs as well as its predecessor it’s going to be an impressive looking high end compact.